This is one of my bloomers. I know they are supposed to baked on a sheet and not in a loaf pan, but a pan is what I have for now. What do you guys think? I think you have nice "bloomers". I'm afraid I'll now be on a liquid diet for a few days as the result of biting my tongue. I must admit that I'm unfamiliar with the term "bloomers" as it relates to bread and baked goods. Perhaps the term is regionally idiomatic or, equally possible, I'm just ignorant and will humbly submit to enlightenment. For me the term's most familiar meaning relates to a feminine undergarment. However, if you're bold enough to proudly show off your bloomers then I'm man enough to admire them and, if necessary, admit my ignorance. And I know of no reason to be ashamed of your pans either. In the immortal words of 'Diamond' Jim Brady, "Them that's got 'em flaunts 'em." The scored top is gorgeous. No rules about what to bake on, or in. Good looking loaf. 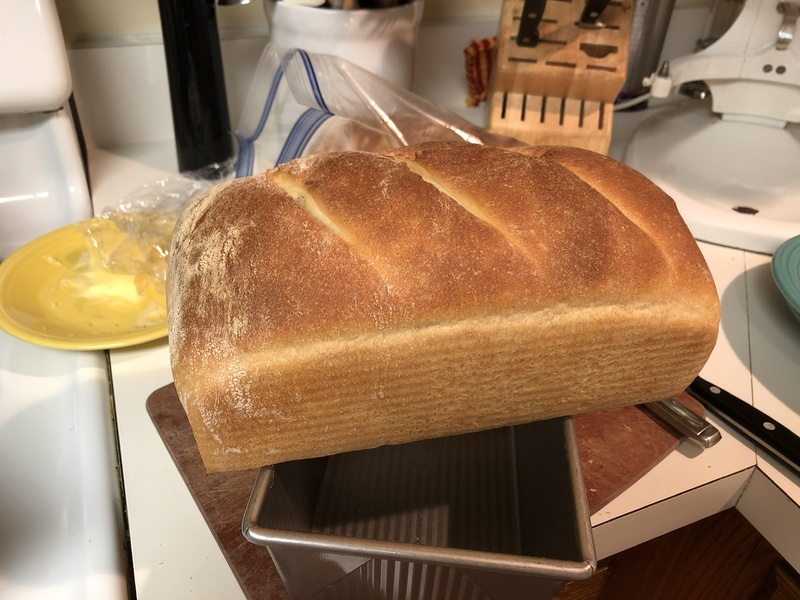 And for the record (I'm one that heartily adheres to this record) there are few hard and fast rules about what or how something should be baked on or in, and especially what shape the bread assumes. If you like using the pullman loaf pan, by all means use it. If you want to take it back to being baked on a baking stone, that's fine too. With few exceptions, we make up our own rules as we go along. To not do that is to hinder some of the "artisan" that we strive for. If you like the loaf pan, and want to take it to a next level, have a look at Abel's Pain Vienoisse to see what you can achieve with this general type of scoring in a loaf pan. Those look amazing. I’m not sure I can pull off that excellent scoring. A nice looking loaf! How was the crumb? For anyone interested in the original bloomer, This Recipe for the dough is, I believe, considered pretty authentic. Elizabeth David in English Bread & Yeast Cookery refers to the shape as "a long plump loaf with squarish ends and evenly spaced diagonal cuts on the whole crust surface". I haven't made it yet, but it's on my list! whenever I see the word "bloomers" associated with bread! Like justanoldguy, where I come from, bloomers were just this side of "unmentionables". As a matter of fact, I think our gym shorts used to be called bloomers (but that was so long ago, that memory is lost in the mists of time). All this to say: lovely loaf! Enjoy it! Bloomer is an English bread. Bloomer is an English bread. I got the recipe from Paul Hollywood’s book, Bread. I know is baked on a sheet, but I did not have one so I used my loaf pans instead.